Vale Natasha Richardson. Condolences to her grieving family. There’s a lot of attention given to this particular death, partly because of the fame of her family, and partly because her death seems bizarre to those who don’t know much about head injuries. There’s plenty to read about both those aspects in the various MSM reports. This tribute from Michael Billington in the Guardian focusses just on her stage work, and his own sense of loss due to the roles he will now never see her play. The stage was the performance arena in which she had steadily carved a niche all her own, no mean achievement for a member of an acting dynasty whose cumulative reputation overshadowed her personal talent in the public imagination, an effect magnified by her marriage to a famous film star. This is of course something that Vanessa Redgrave (and her siblings Lynn and Corin) also had to struggle with in the early stages of their careers, due to the fame of parents Michael Redgrave and Rachael Kempson, and of course Natasha’s sister Joely (and their cousin Jemma) has had to deal with the same combination of the lift in opportunities being a Redgrave has provided along with the increased expectations bundled with those opportunities. Combine that with a dynasty also known for radical left political activism and flouting social conventions. It’s not an easy road to tread, despite the rewards of fame. This is a rather garbled post for Friday Hoyden, where we do tend to mostly point approvingly at women kicking arse. 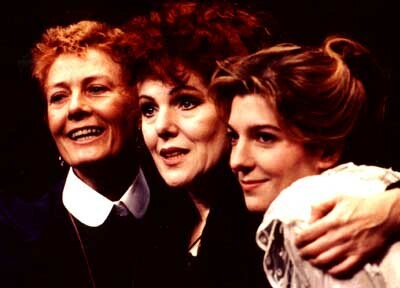 Natasha did kick acting arse in so many ways (as do the other Redgrave women), but there was a lot more going on in her family experience than just its interaction with her career, as there tends to be in the experiences of most people. It’s just that we know more about this family (though mass media consumers tend to think that the salacious snapshots they “know” tell them more about celebrities than those snippets really do). I’m just so sad for all those who loved her, and I wanted to mark the moment. These women were also on my Hoyden list anyway, along with Vanessa’s sister Lynn and Corin’s daughter Jemma, for their various memorable performances. The aspect they share as performers is conveying intelligence, sensitivity, dignity, a certain steely strength beneath a vulnerable shell, and overall a sense of mischief around the eyes. I find this combination highly appealing as a character’s story is told. A prime example of this combination is in Natasha’s portrayal of Offred in the film adaptation of Margaret Attwood’s iconic novel The Handmaid’s Tale. This also hits me hard because she was only a few months older than I am. I also ski (though not for a couple of years). I can’t help but wonder whether she’d still be here if she’d worn a helmet. Lovely tribute, tigtog. I feel quite sad about her death as well, fo rsome reason. Agreed, thank you for this. Really fantastic actresses and apparently classy people also. I have a PSA about the sort of head trauma that killed Natasha Richardson, but this isn’t the time or place. Thanks for this post, Tigtog. Yes, it’s sad, although NR never was much on my radar, but partly for that very reason; she isn’t one of those New Idea Natasha Richardson’s Baby Joy!!!1! or Natasha Richardson’s new baby body makeover!!111! shite. She and the Redgraves are real people, not botoxed social x-rays. When my lovely SIL had an aneurysm I learned that some people have ‘em for years lying in wait, and they don’t manifest themselves unless there’s a bump – and as you can see there doesn’t have to be a big bump. Luckily, it’s fairly rare, but yes, helmets helmets helmets!